Oops - we don't appear to have a video for the fi-5120C. for the money this is a great little machine, it scans quickly and quietly. the free Adobe Acrobat software is excellent - ours came with version 8 std. i imagine they will be shipping with version 9 std soon. version 9 has much better scanner drivers, you can set defaults (size, dpi, duplex, color etc) for different document types. it does double feed sometimes, so not really the kind of machine you can leave unmonitored. very good quality for the money, the free adobe software makes it a better buy for us than the Kodak 130/i40 etc. Excellent scanner. The feeder is strong and never pulls through two documents at the same time. Very well engineered piece of kit. Expensive, but you can feel the quality. Full marks. Firstly some feedback for your business: from the initial ordering to the receipt of the scanner, the total service was faultless. Don’t be fooled by its size. A great piece of kit. The scanner is working absolutely brilliantly. It is very fast – very few paper jams or double feeds. The software is fine although we are tending to use the Adobe software much more than the Fuji. It would be good if there was a way to bypass the Twain settings screen when doing multiple identical scans – it is superfluous for this. Fast, friendly and reliable. No trouble at all. Very satisfied. Great little machine – use it daily. This has proved to be a reliable piece of hardware, which has so far given no problems. I have just purchased a cleaning kit which proved to be quite expensive however. 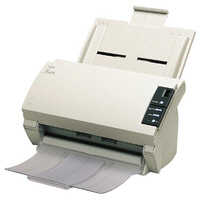 The Fujitsu Fi-5120C document management scanner replaces the Fi-4120C2, offering faster scanning and ultrasonic multi-feed detection! The Fi-5120C offers high quality output resolution up to 600dpi. Control over error diffusion, colour dropout and gamma correction via the driver allows a wide variety of documents to be scanned. The user selectable black/white background enables the use of document deskew and autocropping of mixed document and high quality scanning of thin documents. With a slide away output tray the Fi-5120C can be positioned near the users workstation for ease of use. When not in use the scanner reverts to a sleep mode using only 6 watts of power. The Fi-5120C has both an industry standard SCSI and USB 2.0 interface as standard. The Fi-5120C can accept a post imprinter unit to stamp the back each scanned document with up to 40 characters serving as further proof that all documents have been scanned.